Direct flights to Guam are available from many major cities including, Honolulu, Tokyo, Seoul, Hong Kong, and Manila. With direct flights to Guam from most major destinations in the area, Guam is easily accessible from any world wide destination. The A.B Won Pat International Airport, also known as the Guam International Airport, has been servicing flights to Guam since 1936. As the hub of the Micronesia Region, Guam is a busy airport, with most flights to and from the other Micronesian islands connecting flights on Guam. The airport in Guam is as safe as can be, its staff, technology, and services meeting all Federal and FAA guidelines for the safety of its passengers and workers. Guam is a U.S territory, so arriving passengers must go through U.S. Immigration and Customs. For the departing passengers must go through Transportation Security Administration (TSA). 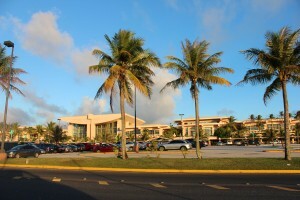 As for the location of the Guam International Airport, it is located in the middle of Guam. The distance from Tumon is just 5~10 minutes, the main hotel area for Guam. From Andersen Air Force Base and Naval Base, the distance to the airpot is about 25 minutes. For those that need transportation from the airport, there is an airport taxi service available. But us locals are always welcoming, so if you need a ride, let us know. In the airport terminal, for those departing from Guam, will definitely find comfort before their flight departure. The airport has its own food court varying in cuisine choices, a coffee shop, and drink concession stands. If you are looking to do some last minute shopping, the Duty Free Shopping Outlet has in stock many name brand clothing, cologne, accessories, cigars, and more. There is a Bestseller bookstore to pass the time while you wait. For those who are premium members of United Airlines and Delta Airlines, there are club lounges equipped with conference rooms, family rooms, showers, and premium wine and dine programs. Airlines that provide services through Guam are: JeJu Airlines, United Airlines, Jin Airlines, Delta Airlines, Japan Airlines, China Airlines, Philippine Airlines, Korean Airlines, Eva Airlines, and Asia Pacific Airlines. A list below shows the non-stop flights to and from Guam, their flight duration, and airline provider. For more information on the A.B Won Pat International Airport, please visit www.guamairport.com or visit your airlines website.